Ch-Ch-Ch-Chia! Groot can grow more than just limbs! 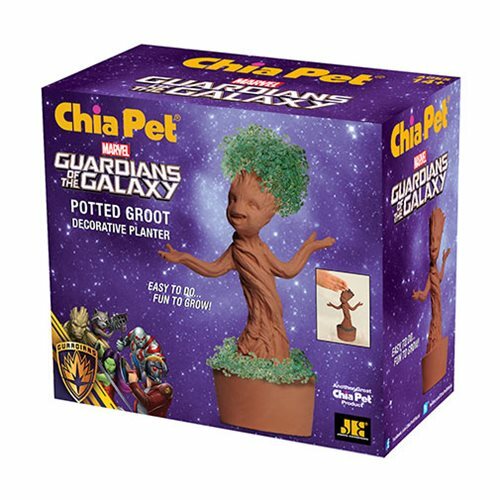 Bring back the joy of arts and crafts with this Guardians of the Galaxy Potted Groot Chia Pet. You'll see a full coat in about 1-2 weeks, and you can reuse your chia indefinitely. Simply replant with chia seeds packets (extra seeds included) or similar herb seeds such as basil, alfalfa, marjoram or thyme. Package contains a chia handmade pottery planter, chia seed packet for 3 plantings, convenient plastic drip tray, and planting and care instructions Sheet.